Many Halloween parties really aren't very scary and instead are centered around socializing, eating and simply having fun. There are some party hosts, however, who aren't satisfied with this type of party. If you're interested in created a Halloween party that is sure to raise the hair on the backs of your guests necks, then check out these party ideas. The following can be adapted to suit the location and your guest list. If you really want to scare people, a haunted house will certainly do the trick. Pulling off this scary Halloween party will take some pre-party planning, and you'll need quite a bit of help. If you do it right, however, your guests may talk about your party for years to come! 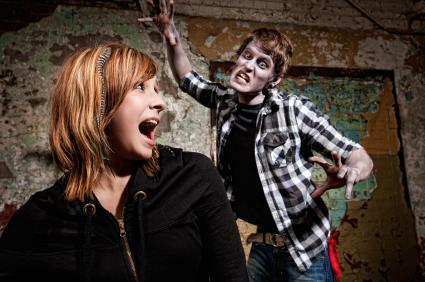 Location: The best place to create a haunted house is a basement, garage or even a barn. Make the room or building as dark as possible, then strategically add dim lights where needed. To achieve nearly total darkness, cover the windows completely, and for added effect, drape the walls with black fabric. This same fabric can be used to create "rooms" within the large space. Layout: One of the best ways to scare party guests is to confuse them. Create a labyrinth of rooms in which guests are easily turned around to confuse their sense of direction. Props: If you have enough forethought to begin planning your Halloween party immediately after the previous Halloween, you may be able to find great deals on scary supplies like props and costumes at department and specialty stores. If not, you can spend a small fortune stocking up on realistic looking props, so ask friends and family if you can borrow any Halloween decorations and props they might have. Fog machines, dimly lit jack o'lanterns and cobwebs are must-haves to create a terrifying atmosphere. Participants: If you really want your haunted house to be scary, you must have willing participants to play the parts of ghouls and goblins. Ask friends and relatives to dress up in scary costumes and station them throughout the haunted house. Caution them not to actually touch the people who wander through the house, although they can use soft items like feather dusters to gently brush the ankles of unsuspecting guests. Finally, choose one or two scary soundtracks with spooky sounds and music to play continuously throughout the night. If you really want to know how to make the scariest Halloween party ever, then consider hosting the party outside. Keep food simple by allowing guests to roast hot dogs and marshmallows over a bonfire. Set up tables with chips, brownies, cookies and drinks so guests can serve themselves. Create a haunted forest or field much like you do a house. Position costumed "spooks" throughout the field or woods so that they can jump out and scare unsuspecting guests. If you are using a field, cut a path through tall grass and have a few guides positioned with flashlights to guide the way. This works great in a cornfield as well if you cut down the cornstalks to create a maze. For an added touch of terror, position one "spook" at the end of the path with a chainsaw. (Remove the blade of course!) Each time a group of people approaches, he should crank the chainsaw and chase them back to the starting point. 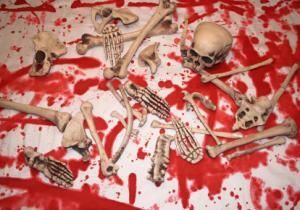 Create a scary scene with skeleton bones! Ask a few friends to dress up like spooks and instruct them to wander in and out of the party, stopping to stare at guests but never speaking to anyone. Occasionally, turn all the lights off, and have a few friends crawl around the floor of the room, grabbing ankles. Turn off the lights, use only one dim light or flashlight, and invite party guests to take turns telling ghost stories. Place a "fortune teller" in one room, dim the lights and let guests take turns getting their fortunes told. Use a fog machine to create a chilling ambiance in the home. Create a "zombie room." Set aside a room off the main party area and cover it with chains, locks or yellow caution tape. Have some friends stand on the other side and rattle the door as if they are coming out. At a point later on in the party have the door burst open and the zombies begin to circulate in the room. Wet some strings and hang them from the ceiling in a dimly lit room. As the guests walk around they will be brushed in the face with slimy "cobwebs" adding to their fright. Toss some body parts such as fingers, toes and eyeballs into snack dishes. Make sure they get buried slightly so they aren't easily seen until they get added to a plate. Have someone pull the main breaker on your electricity at a preplanned hour. Act frightened and dismayed as if you don't know what's happening. Be sure to comment that streetlights and the neighbor's lights are still lit. Creating a scary Halloween party is easy if you use your imagination and ask for lots of help from family and friends. Don't be surprised if your party guests beg you to host another party next year!